Nice, evenly matched mid to lesser grade lot of 40 different cards (5 HOFers) from the cornerstone 1909-11 T206 issue. Most cards range in the VG to EX category with some lesser. All Sweet Caporal. With some scarce variations. Sweet Caporal 150/25 (6)(SCARCE): Ames(Portrait), Jones(St. Louis), Keeler(Portrait)(HOF) G-VG, Leach(Portrait), Rucker(Portrait). 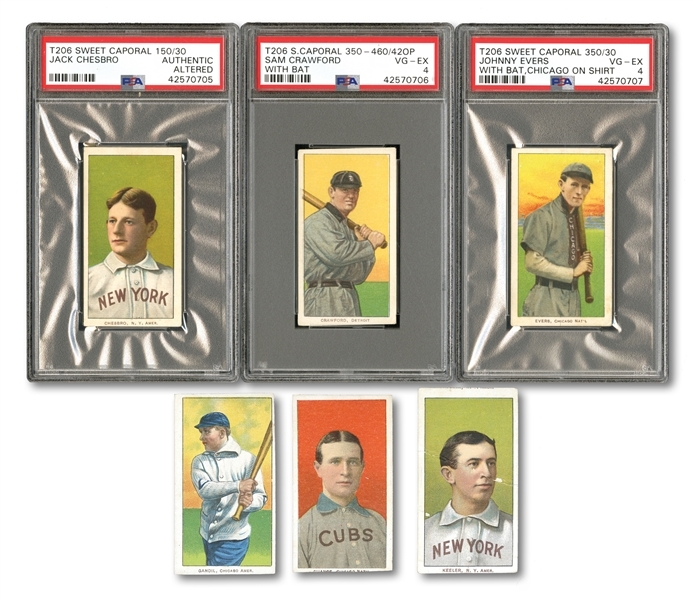 Sweet Caporal 150/30 (10): Ames(Hands at Chest), Chesbro(HOF)** PSA AUTH, Crandall(Portrait, No Cap)**, Durham*, Hahn, Jacklitsch**, Lake(New York)**, Schaefer(Detroit), Shaw(St. Louis), Stahl(No Glove), Stone* **. 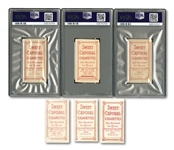 Sweet Caporal 350/25 (3): Chance(Red Portrait)(HOF)**, Chappelle(ML), McIntyre(Detroit). Sweet Caporal 350/30 (11): Clymer(ML)*, Cross(ML), Doyle(N.Y. Natl., With Bat)**, Dunn(Brooklyn), Easterly**, Evers(Chicago Shirt)(HOF) PSA VG-EX 4, Kroh, Leach(Bending Over), Livingstone**, Pfeister(Seated), White(Chicago, Pitching). Sweet Caporal 350-460/25 (2)(SCARCE): Ames(Hands Above Head), Murphy(batting). Sweet Caporal 350-460/30 (6): Abbaticcio(Blue Sleeves), Bell(Pitching Follow Thru), Bergen(Catching), Camnitz(Arm at Side), Gandil(Black Sox), Meyers. 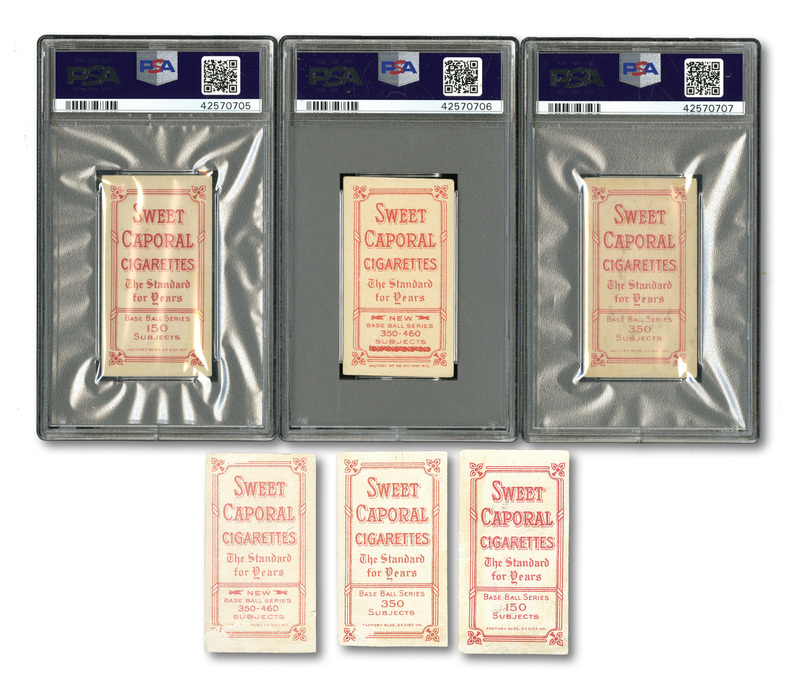 Sweet Caporal 350-460/42OP (2)(SCARCE): Crawford(With Bat)(HOF) PSA VG-EX 4, Frill. *Back damage. **Mis-Cut or Trimmed. (ML) = Minor League.